While only the strong survive, the Survivor’s Remorse TV show on Starz has been cancelled after four seasons. THR has confirmed there will be no fifth season of the scripted comedy. According to the report, “The season finale on Sunday will now serve as a series finale.” However, by our reckoning, there are two remaining episode in the fourth and final season. We have the descriptions for episodes 4.09 and 4.10, below. Set in the world of professional sports, Survivor’s Remorse stars Jessie T. Usher, RonReaco Lee, Erica Ash, Teyonah Parris, Tichina Arnold, and Mike Epps. The Starz TV series centers on Cam Calloway (Usher), a young basketball star whose lucrative contract with a pro basketball team catapults into the limelight. Showrunner Mike O’Malley executive produces with Boston Red Sox Chair Tom Werner, and LeBron James. The current fourth season of the Starz basketball comedy will be its last, The Hollywood Reporter has learned. The season finale on Sunday will now serve as a series finale. Cassie visits Rodney in prison as part of her journey to her Catholic confirmation. Reggie tries to persuade Cam to invest in Chen’s real estate deal. Missy gets some money from her father to invest in the same deal. Cam and Allison’s families get together for an engagement dinner. Cam and Reggie are at odds about getting involved in a deal that involves abandoned school property, Missy is determined to pursue any lead that might get her out of the shadow of the Calloway clan and M-Chuck’s pursuit of her writing talent pits her against Cassie in a way that might never get resolved. A surprise revelation from Jimmy Flaherty leaves Cam with a choice to make: suit up or sell out. We have asked Starz to clarify which episode will serve as the Survivor’s Remorse TV series finale. We have also inquired as to whether all ten episodes will run, or if one will remain unaired. When we know more, you will, too. 10/11 update: Starz confirms its cancelled Survivor’s Remorse TV show will end with a two episode TV series finale on October 15th. Details here. The fourth season of Survivor’s Remorse is averaging a 0.22 rating in the 18-49 demographic and 557,000 viewers. Compared to season three, that’s down by 41% and down by 35%, respectively. Still, among the Starz TV shows we’re tracking, Survivor’s Remorse ranks fourth in terms of its demo numbers and fifth in terms of total viewership. What do you think? 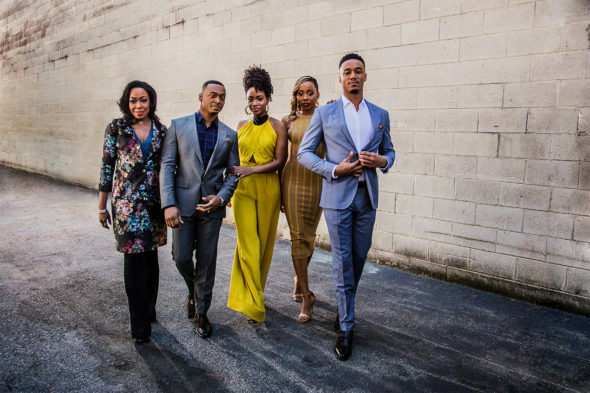 Are you a fan of the Survivor’s Remorse TV series? Should Starz have cancelled or renewed this TV show for season five? Sad to see this show was canceled. Funny show at times, sad at times but on the whole it had a good story line. First Scandal, then Being Mary Jane, now Survivor’s Remorse. Please stop cancelling these OUTSTANshowsand AWESOME shows! There are too may loose ends. This is more of a SEASON ending and not a series ending. I REALLY enjoyed this show. I believe if there was some type if way to bring back Uncle Julius, the show would’ve kept it’s higher ratings. Honestly, I didnt know Survivor’s Remorse was ending until I watched the last 2 episodes for the THIRD time! They should find a way to bring SR back! And not just to end it. A.B.T. This is ashame! Great stories. I am disappointed. Excellent stories and great acting and writing. Great characters. I thought Starz would at least give it a 5 season. Mature story lines and great chemistry. I hope we see Survivors Remorse again. The last episode has to be the worst ending of a show in history. Just too abrupt! Makes the Sopranos ending look prophetic. Typical Starz. I swore I would never watch Starz after they dumped Magic City the same way. I wish they would add another season to tie up the loose ends. this is the most refreshing and realistic show on television today. Everyone I have recommended it to has also fallen in love with it, we can’t wait until Sunday night for the next episodes. Truly sorry this decision has been made and hope the network reconsiders.